Rejuvenate your senses and escape to paradise! Come and enjoy a romantic and relaxing getaway at this cozy mountain cabin nestled amongst the gorgeous pine trees with a beautiful view of picturesque Lake Arrowhead. You'll love this comfortable, 1640 square foot, 3-level newly remodeled cabin with a large fireplace and free firewood. It's absolutely perfect for a week or even just a weekend getaway for any couple, family, or group interested in hiking around the lake or to Lake Arrowhead hot springs, shopping in the village, or just relaxing in the fresh mountain air. Two bedrooms are located on the mid level and a spacious upper level loft that sleeps 4 more with a beautiful lake view. The lower level has been recently completed and offers a recreation room with a 50" smart TV, wet bar, full bathroom and a new bedroom with a queen bed. Each level has its own bathroom. The kitchen is fully equipped so that you may enjoy cooking and dining indoors, or if you prefer, use the propane barbeque on the large second-story redwood deck, and dine outside while enjoying a fantastic view of the lake. You may also take your pick from a variety of restaurants in Lake Arrowhead Village which are within two miles of the cabin. There is a foosball machine for those game fanatics. Enjoy the 42' wide screen HD TV, along with a 3D DVD Blue Ray with Streaming capabilities in the living room. I also just installed a music bar surround sound. Be sure to find some time to unwind at this wonderful mountain retreat in gorgeous Lake Arrowhead! Beautiful sunrises and sunsets with incredible colors lighting the backdrop of the San Bernardino Mountain range. You can wake up or drift off to sleep while viewing the lake from the queen bed in the third floor loft, mid-level living room & outside redwood deck! Upper level loft bathroom has shower & toilet, Mid-level bathroom full bath with toilet and tub/shower Downstairs level bathroom full bath with toilet & tub/shower. 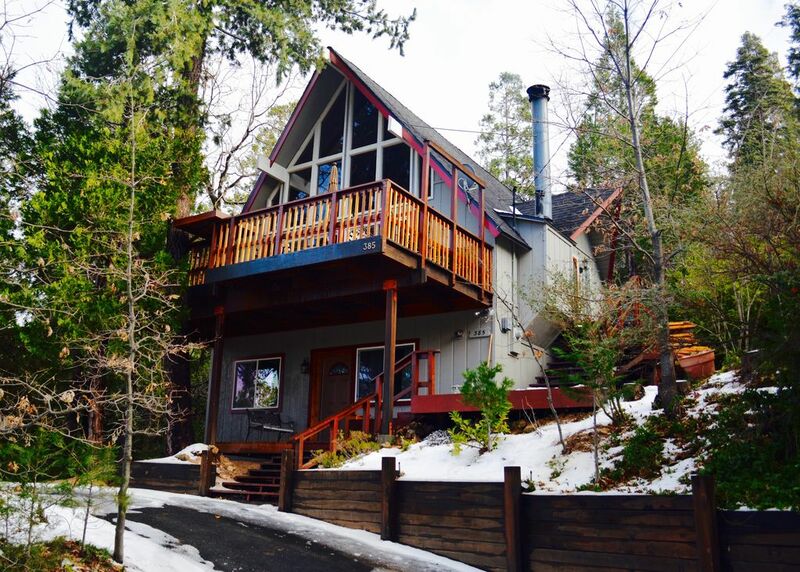 Enjoy the beautiful view of Lake Arrowhead from the deck or the loft. There are 3 TV's. The mid-level living room has a 48" smart TV, the lower level recreation room has a 50" smart TV and the lower level bedroom has a 24" TV. I just installed a Samsung blue tooth music sound bar, so you can stream your personal music choice directly from your computer, tablet or Iphone. Chess board, fuseball and multiple board games available. Relax in the hammock during the summer months on the beautiful second floor redwood deck with a gorgeous lake view! Snow Valley is approximately 9 miles from my cabin and takes about 20 minutes to make the drive. We had a wonderful winter wonderland stay at the cabin. The cabin was clean and well supplied. We thought it was short on towels till be found them in the drier when we went to dry some snow clothes. The cabin has that mountain feel and overall we had a great weekend. The cabin is a great size and decorated beautifully. We had a stunning view of the lake and loved sitting by the fireplace. We had a great time while there and were even blessed with a little bit of snow on our second day. The cabin is very nice with updated appliances and a very nice view of the lake from the deck. A well-appointed, cozy-yet-modern cabin in a great location. What more could you ask for? Comfortably slept our 5 adults, 2 kids and scruffy little pup. We hope to visit Chris' cabin again soon! Thank you Tyler for the thoughtful review. As I mentioned previously, we have owned the cabin for 25 years and enjoyed it a great deal ourselves and that includes not just Karen and I, but my two adult daughters and young grandchildren. It is truly a great place to re-energize yourself. I will look forward to hearing from you folks again in the future. What an adorable mountain retreat! Thanks Julie for the nice comments. I am in the middle of a remodel of the middle and upper floor loft areas. Since I did the lower level 2 years ago I felt the upper two levels need address. Hopefully if you make it up again, you will see new paint, new kitchen and new flooring on those upper two levels. Awesome place for the price. Stop looking book this! Overall, My family had a pleasant experience with the owner, Arrowhead and home. Agustin, thank you for your great review of my Lake Arrowhead cabin. I appreciate your business and I’m very pleased you folks had such a great time. A cleaning allowance is to be added to the rental fee, which is $100. If my cleaning lady's invoice exceeds $100, I simply deduct any amount in excess of the $100 from your $150 refundable security deposit and return the balance due you along with a copy of my cleaning lady's invoice.